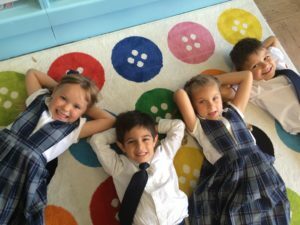 At St. Nicholas, kindergarten is taught thematically around language arts, math, science, social studies, art, writing, and religion. Teachers do assign homework, but it is always fun and family-focused. We welcome your involvement! Each classroom has a roster that offers parents a chance to volunteer on field trips, special events, or specific times during the day. Teachers communicate with families through e-mail, student folders and, of course, in person. Teachers utilize the Reading Street guidelines that encourage children to be active, thoughtful, proficient readers and thinkers. We structure our lessons on basic reading strategies, spelling, phonics, and grammar. A large block of time is dedicated to reading and responding, which affords the students time to work in small groups and share what they learn. The writing curriculum compliments our reading curriculum where students explore oral and pictorial story-telling, emergent writing, and fluent writing. In second grade, students learn how to turn the events of their lives and imaginations into detailed, developed, and organized stories and essays. By third grade, our students have learned how to turn extended paragraphs into persuasive essays. In first grade, we focus on building basic math facts. In second grade we explore measuring, graphing, place value, volume, addition and subtraction with larger numbers, and the beginning concepts of multiplication and division. In third grade, students are exposed to computation, measurement, data collection, statistics, geometry, ratio probability, graphing, simple algebra, estimation, mental arithmetic, and patterns and relationships. Our science curriculum program uses hands-on scientific inquiry to support and inspire learning. In first grade, students explore the diversity of life in the plant kingdom, the physical world, earth science, and life sciences. In second grade, we introduce air and weather, balance and motion, balancing and weighing, and insects. In third grade, we explore water, land formations, sound, and organisms. We discuss citizenship, family life, economics, communication, family living, government, history, and geography. Every two weeks, students are expected to discuss an article from a news source regarding a relevant current event. Students love the opportunity to become news experts! STEAM is offered to all students!Weekly visits to the STEAM Lab allow students to think critically and have an engineering or design approach towards real-world problems while building on their math and science base. STEAM programs add art to STEM curriculum by drawing and encouraging creative solutions. We are teaching our students at a young age to be innovative problem solvers.